Simmered in a tangy Hungarian yogurt marinade, this hearty and exotic one-pot meal is the perfect way to warm up a cold winter night. In a large mixing bowl, stir together yogurt, lemon juice, paprika, salt, black pepper, garlic powder, onion powder and cumin. Place the pork loin in the Multi-Function Cooker vessel. Working in the vessel, rub the pork loin all over with half of the yogurt marinade. Add the carrots, potatoes and onions to the bowl with the remaining marinade, stirring to coat thoroughly. Pour over the top of the pork loin. (Can be assembled, covered and refrigerated up to 24 hours ahead). 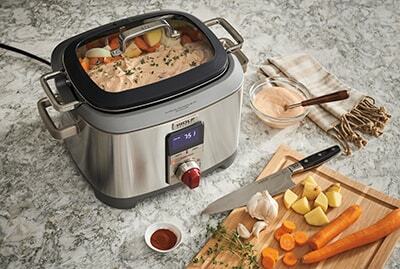 Cover and set the Multi-Function Cooker to Meal Timer Mode for 8 hours. Press start. When the program has completed, remove the pork loin, carrots, potatoes and onion to a serving platter. Cut the pork into slices and pour a cup of the broth from the vessel over the top. Garnish with chopped parsley and lemon slices.